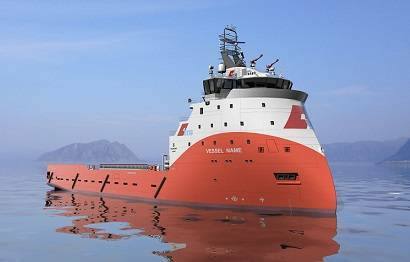 The ROC yard, China, will construct two platform supply ships of Ulstein’s PX121 designs for the ITG Group. The contract includes an option for two additional vessels. 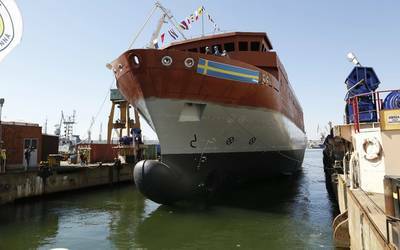 According to Ulstein, the PX121 has become very popular among various ship-owners and investment companies, and ROC is a new yard entering the stage of constructing vessels carrying the X-BOW hull line design from Ulstein. This inverted bow leads to reduced speed loss in waves, and consequently less fuel oil consumption, and the absence of slamming is an attractive feature as the comfort for the crew is increased. Ulstein Design & Solutions provides a comprehensive design and equipment package that includes basic and detail design, all major equipment, site support/construction consultancy and commissioning. The ships have a length of 83.4 meters and a beam of 18 meters, and meet the requirements of DNV’s Clean Design notation. They have a load capacity of approximately 4,000 tonnes and a cargo deck of 840 square meters. Maximum speed is stipulated to 14.5 knots. This version of the medium-sized PX121 platform accommodates a total of 30 persons. The vessels will be prepared for an ROV mezzanine deck and a subsea crane for future installation. They will be built in accordance to IMO’s SPS Code (Special Purpose Ships) for carrying specialized personnel, and will have OILREC class notation for oil recovery in emergency situations. The vessels are planned for the European market and are suitable for worldwide operation. The vessels are planned for delivery in the first half of 2015.